In preparation for The Asahi Shimbun Display of Dürer’s paper triumph: the arch of the Emperor Maximilian a team of specialists gathered to move the famous woodcut of the Triumphal Arch by Albrecht Dürer. Joanna Kosek describes how they managed to move and dismantle the print over the course of one night. The print recto (front) in direct light. Albrecht Dürer, The Triumphal Arch. 1515-1517, Paper, woodcut, H: 357 cm, W: 295 cm, British Museum E,5.1. 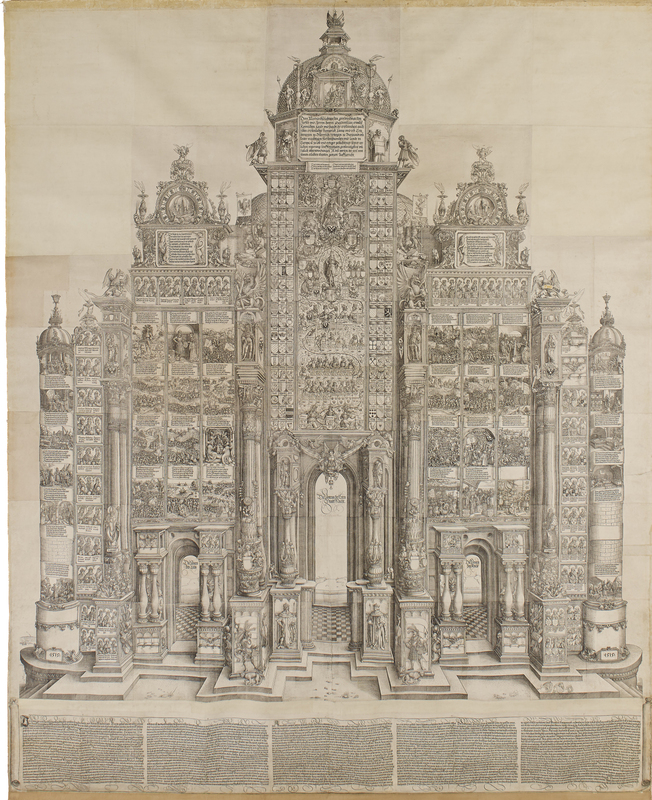 One of the largest prints ever produced, this fantastic arch on paper was commissioned by the Holy Roman Emperor Maximilian I (r. 1486–1519) to rival the arches of the ancient Roman Emperors as his own propaganda piece. Unlike the stone forerunners of antiquity, his print came in multiple copies out of Dürer’s workshop for distribution throughout the Holy Roman Empire. The giant print measures nearly 4 x 3 metres and was originally printed from 195 separate woodblocks. The copy in the British Museum’s collection arrived in 1834, and was eventually housed in its current enormous metal frame in the 1970s. Now it was needed to be the star in the new Asahi Shimbun Display Dürer’s Paper Triumph: the arch of the Emperor Maximilian in Room 3. Our task that night was to take it out of the frame and remove the glass in preparation for its move across the Museum. There were many unknowns ahead of us – we didn’t know precisely how the frame was constructed or attached to the wall. All we knew for certain was that the whole thing was extremely solidly made and incredibly heavy. The glass taped up and the print in the process of being detached from the wall. This operation was preceded by months of planning and generated the fattest risk assessment folder ever seen. We began by taping the glass using the toughest tapes in the building, after which we had to lift the frame from the wall. This turned out to be fixed to large steel brackets bolted to the gallery wall and must have weighed nearly half a tonne. This first operation took at least four hours and we all held our breath until the frame, ingeniously, was raised and detached by a large lifting frame, normally used by the National Gallery to take their largest altarpieces off display and kindly lent to us for the job. We could then dismantle the frame into four separate components. Once this was done we could assess the construction of the mount and backing. It was at this stage that we also realised that we were dealing with 10mm thick plate glass weighing about 150kg in total. It took some four hours of carefully considered steps before, at around 3am, the glass was finally separated from the print with full precision and total control. The print, escaped from the green-tinted glass, turned out to be a beautiful impression on choice early 16th-century paper. Plate glass detached from the print. Plate glass swivelled to lay flat on the floor. At last Dürer’s masterpiece could be fixed to a temporary aluminium support frame and screwed onto the wall without the threat of the glass breaking. Meanwhile, glass experts attached massive spider-like suckers to the centre of the glass, swivelled it flat on the floor, and cut it into metre-square pieces for safe disposal. It was now around 6am. The print protected and ready for hoarding. Hoarding being built around the Triumphal Arch. The moment the glass was wheeled out and we were all ready for bed, a team of joiners arrived to put up a protective hoarding around the print. They had exactly three hours before the Museum opened and worked like the flying squad, assembling 20 large panels into a neat white enclosure within the Minoan Gallery. I was handed the key to the great treasure chest just as the first visitor arrived at 10am on Tuesday morning.